Present in every cell of the body, cholesterol has a significant effect on your well-being. The consequences of cholesterol levels can be beneficial or dangerous depending upon the type being measured. While one type (HDL) is associated with positive health outcomes at higher levels, the other (LDL) is a contributing risk factor for a number of medical conditions, including high blood pressure and heart disease. 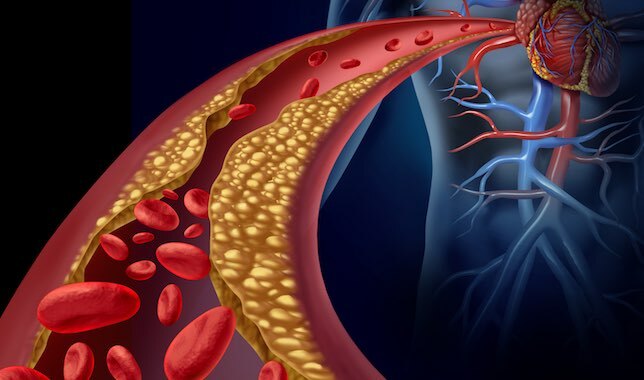 Cholesterol circulates through the bloodstream by adhering to lipoproteins. The size and shape of these complex structures determine their classification and whether they are considered harmful or beneficial. There are two types of cholesterol. Low-density lipoprotein (LDL) is the bad type of cholesterol. This unhealthy substance can cause plaque to accumulate on the interior portion of your arteries. This restricts blood flow and raises the risk of high blood pressure, heart disease and stroke. Blocked arteries reduce the flow of oxygen-rich blood from your heart to the rest of your body. The higher the amount of LDL cholesterol present in your blood, the greater your chances are of developing heart problems. High-density lipoprotein, or HDL, is the good cholesterol. It helps remove excess cholesterol from your body and transports the lipid to your liver for removal with other metabolic byproducts. In the United States, more than 73 million adults suffer from elevated LDL levels. A helpful hint is to remember “H” for high and “L” for low. You want higher levels of HDL cholesterol and lower levels of LDL cholesterol. Watching what you eat. Limit the amount of foods containing cholesterol, such as dairy products, red meat, and baked goods, as well as processed and fried foods. Choose healthy foods like fruit, vegetables, and whole grains, along with low-fat dairy products and healthy fats. Getting regular exercise, and watch your weight. Being physically active and shedding those extra pounds helps lower your level of LDL cholesterol while raising the level of HDL cholesterol. Not smoking. The oxidative stress damages your arteries by raising the level of bad cholesterol while lowering the amount of good cholesterol. Genetics plays a significant role in how much cholesterol is produced by your body. Factors beyond your control could generate too much cholesterol or make it difficult for your body to remove it. This means that even if your lifestyle is healthy, MD Now recommends that come in to any of our locations and have your cholesterol level checked regularly. People with certain medical conditions like diabetes and thyroid problems may also have difficulty controlling the levels of cholesterol in their bodies. Because high amounts of cholesterol may not cause obvious symptoms, you should monitor your levels by having a cholesterol test performed at least once every five years. You should be tested more often if you have a family history of high cholesterol and heart disease. When patients have a cholesterol screening at urgent care clinics, a blood test called a lipoprotein panel will be ordered. It is used to determine the levels of cholesterol in your body. Along with triglycerides, a type of blood fat, the results will show the total amount of cholesterol, as well as the individual levels of LDL and HDL cholesterol. While there are desirable goals, your normal cholesterol levels will also depend upon your individual circumstances. Having a cholesterol test at urgent care centers will help you keep your cholesterol within these recommended ranges and reduce your risk of cardiovascular disease and stroke. Along with recommending appropriate lifestyle choices, your doctor may prescribe medication to control your cholesterol. These statin drugs, as well as prescription doses of niacin and bile-acid sequestrants, can help prevent heart attacks and strokes by lowering the amount of cholesterol in your body. Your doctor will determine whether these drugs are right for you based on factors like your age, medical history, and lab results. If you have questions, you can stop by the nearest MD Now Urgent Care to discuss your concerns with a doctor. Discover the caring, convenient, and cost-efficient treatment that can always be found at MD Now. All of our locations are open from 8 a.m. to 8 p.m. seven days a week, 365 days a year, and operate on a walk-in, no-appointment basis to conveniently suit your schedule. With 31 locations throughout Palm Beach, Broward, and Miami-Dade counties, quality care is always within your reach. For the South Florida locations nearest you, visit http://www.mdnow.com/locations.